﻿ How to Import Cannon, JVC, Panasonic MOD files to iMovie? Home » video » How to Import MOD files to iMovie from Canon, JVC, Panasonic? How to Import MOD files to iMovie from Canon, JVC, Panasonic? Just as we know, MOD files are not natively supported by iMovie. Therefore, it has become the most frequently asked question on how to successfully import MOD to iMovie for editing. The following article just aims to solve the above issue in two solutions. Solution 1 is free and with no need of video format conversion but cannot solve importing all kinds of MOD files to iMovie. Solution 2 can help to import various MOD movies to iMovie whatever the MOD files is from digital camcorders like the JVC Everio, the Canon FS100 and the Panasonic D-Snap SD-card camcorders or downloaded from internet or got from friends and etc. 4) Restart iMovie, be sure you're using the "Import from Camera" option in the File menu, then iMovie will detect the external drive as a camera and allow importing all the clips using the date created/modified info as timestamps for perfect cataloguing. 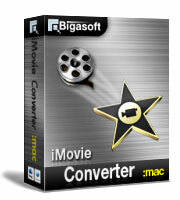 Free download the professional MOD to iMovie Converter - Bigasoft iMovie Converter for Mac, the following main window will pop up. 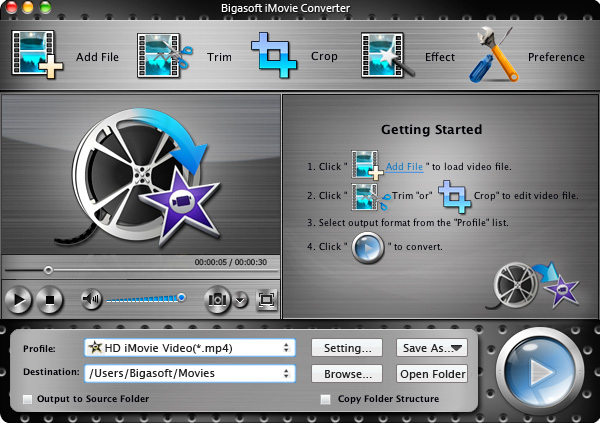 Acting as the powerful MOD to iMovie Converter, Bigasoft iMovie Converter can convert all kinds of MOD movies to iMovie supported MPEG-4, MOV, DV, and MPEG-2 for fast import MOD to iMovie. Besides converting MOD to iMovie, Bigasoft iMovie Converter also helps to convert other video formats including AVI, MPEG, MKV, VOB, WMV, WTV, 3GP, AVCHD, MTS, MXF, MVI, ASF, FLV, WebM and etc to iMovie supported format for easy importing and edting. If your MOD files are from camcorder, firstly copy the MOD files from the JVC, Canon or the Panasonic camcorder to computer, then click "Add File" button to import your MOD files. 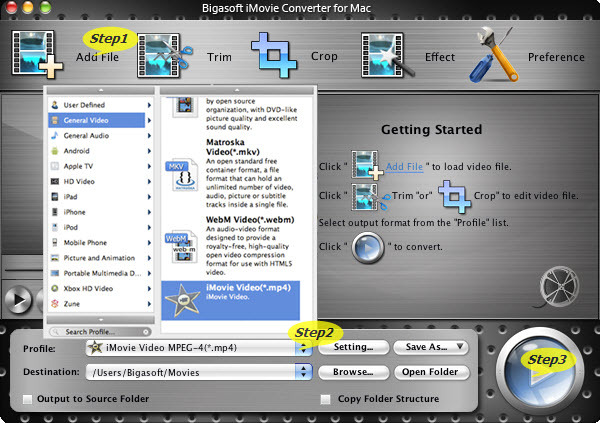 Or simply drag and drop the MOD movies directly to the main interface of Bigasoft iMovie Converter for Mac. Click the "Profile" drop-down button to select iMovie Video MPEG-4 output format from "General Video" category. Click "Convert " button to begin the MOD to iMovie format conversion. It will be finished with high output quality and fast converting speed. Click "Browse..." button to choose a folder where the converted MOD files will be. Open iMovie, click on File > Import > Movies...to import the converted MOD into iMovie. It is that easy to import MOD to iMovie like JVC MOD to iMovie, Canno MOD to iMovie, Panosonic MOD to iMovie with the above step by step guide.